Neighbors Opposed to Privatization at Earle: EPA responds to NOPE postcards! The community's actions do have an impact (so continue to get your friends and neighbors to sign and submit the postcards we've been distributing since late-October), as evidenced by this letter from the U.S. EPA to NAVFAC (and copied to NOPE's mailbox), which references our postcard campaign and that, unfortunately, the EPA is seemingly unwavering toward its favorable view of the Laurelwood civilian housing plan at NWS Earle. 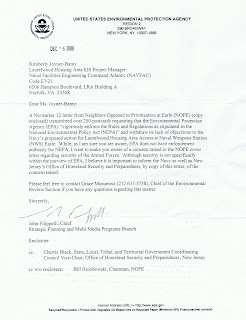 Our contention from the get-go of NAVFAC's Environmental Impact Statement (EIS), a prerequisite filing for any agency (in this case, for the Department of Navy to construct a new, unimpeded civilian access road and two bridges thru its base), has been that the Navy misled the EPA on its "purpose and need" for the project and that the plan (of the five presented) with the least environmental impact was the NO BUILD option (basically, no civilian road or housing). NAVFAC lied that it has to go thru with the project, which NOPE has proven to be false, and therefore the EPA should make NAVFAC re-open the study and issue a new EIS, providing all agencies with a true security and cost-benefits analysis. To be sure, NAVFAC (the DoN's) lack of candidness is what has prompted federal and state legislation, lawsuits, community outrage, etc. Anyway, what we can take from this latest EPA letter is that a) the EPA is clearly aware of the NOPE community's objections to complacency toward the National Environmental Policy Act and b) that within the coming weeks NOPE will step up the environmental food chain, so to speak, and target The Council on Environmental Quality (CEQ) Chairwoman Nancy Sutley (a director policy advisor to the President) to enforce NEPA guidelines. We continue to need the community's support on this front.